The Nile Project launches the first of its activities with The Nile Gathering, a long-term project combining music, education and social enterprise to connect the Nile Basin countries and solve the Nile's ecological and political issues. The Nile Gathering will be a four-day workshop, from 10-14 January in Fekra Culture Centre on the Nile bank of Aswan, bringing together actors from across civil society, culture, agriculture, cross-cultural dialogue and educational institutions to build on the vision of the Nile Project and expand the network of people working under its umbrella. The gathering will be facilitated in the 'Art of Hosting' style, using innovative methods of brainstorming, planning by drawing on the group's collective intelligence to harvest results from a large group of diverse participants in the process. The workshop is meant to use real meaningful conversations to set the blueprints for cultural dialogue and interaction on Nile issues. The gathering will be followed by a two-week music residency, bringing together musicians from the Nile Basin countries to create pieces reflecting the cultural melting pot they will experience as the world gets smaller that bridge a clear cultural gap in the region. The residency will be under the direction of musical expert Miles Jay, who has extensive experience with Middle Eastern musical fusions. A concert will be hosted by the end of January in Cairo, as an official launch the Nile Project to the public, and to showcase the cultural fusions that are expected to occur when some of the most talented musicians from the eleven countries of the Nile Basin interact on a meaningful level. The Nile project is the brainchild of Mina Girgis, who grew up in Egypt and later moved to the United States where, in San Francisco, he studied Ethnomusicology; a mix of anthropology and music that focuses on the people playing music. His research in the past includes studying gypsy music and exploring roots of gypsies in Europe that can be traced back to India. After a long history of researching cultural imagination and world music and how people understand this music, his attention was drawn to the Silkroad Festival Project; music project that followed the Silkroad that stretched through China, central Asia, the Middle East and Europe. That silk trade route stretched not only across centuries and trade, but cultural practices. The project focused on music and people from these regions and how the route impacted the music. The Nile Project derives its concept from the Silkroad Project, however, according to Girgis, the Nile, in spite of how it connects eleven countries geographically, did not historically have an impact on cultural connections between 400 million people of the Nile Basin countries. "We are creating this exchange that could have happened and hasn't happened," Girgis explained. "We're looking into how the Nile has connected us, even though we never knew we were connected," Girgis told Ahram Online. "The people along the Nile, most of them have never met and never knew each other." Girgis further explained that the impact of the project transcends cultural exchange, despite its value, but that this exchange can have a role in creating dialogue solving the Nile Basin issues that have been going on for more than 20 years. After a series of all-but-failed political processes aiming to reach an agreement on how to divy up the scarse Nile water resources, the different countries ideas started floating that perhaps the answer to the problem will not be through treaties but must come from the people. The people of these countries must develop their own awareness of each other and build relationships to start looking at the Nile Basin as a regional reality. "Cooperation is the only way we will solve these issues," he told Ahram Online. "Everyone is using more water than the river can give; we have to think of how we can use this water better. How do we transcend the quantity of water? What kind of projects can we do to minimise the water we use and cooperate on a transnational level to share it?" he continued. "Environmentally the Nile can be sustainable; the amount of water can fit the populations of these countries if we all cooperate. How do we get to that? We need a healthier dialogue. We need people to be more aware of what their lives are about and how they relate to the river. It will come from people being open to cooperate with each other and see the river as the connection between us all," he concluded. Girgis and Hadero spent most of 2012 travelling across the Nile, meeting musicians, development organisations and cultural institutions, gathering more ideas for the project and developing a more concrete plan. The ambitious project is large scale and set to span over three years, and includes many actors across all sectors: educational, cultural, environmental, agricultural and others who have a role in the Nile's sustainability and cultural and political barriers associated with life-giving river. Besides the two launch events, the project aims to cooperate with educational institutions to create a Nile Curriculum on the history, geography, ecology and cultures that surround the Nile Basin. 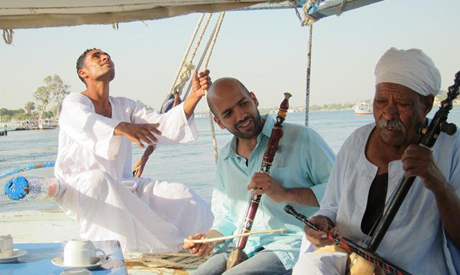 Another educational event are Nile Camps, that aim to bring together young musicians from different countries from the region to learn about the river's eco-systems and local realities by day and create music together during the evenings. Other projects are launching TEDxNile and an online platform for people to share their perspectives on Nile issues through videos. Another very creative project, will be the Nile Tour, a boat made of entirely recycled materials that will sail from the Mediterranean to Aswan carrying musicians, cultural activists and civil society actors from the Nile countries, holding different concerts and workshops promoting a sustainable culture along the banks of the Nile. The project, although ambitious, uses a creative and innovative approach to dealing with the issue at hand and attempts a sustainable, earnest cultural intervention that hopes to see a real impact on the ground. Your pioneer work will bear fruit for all countries along Nile River. Thanks AO for your vision an in addressing the problem. Freedom of expression is great hing we have now.